If you have missing or broken teeth which are affecting your smile, then a dental crown or bridge may be the perfect cosmetic dentistry solution for you. Not only do they help to restore your teeth, but they also enhance it aesthetically to give you the more confident smile you deserve. Whether your treatment consists of a crown or bridge, you can be assured that each restoration is customised to look and feel as close to your natural tooth as possible. Additionally, our dentists use the safest and highest quality materials in all of our dental work, so you can rest easy knowing you’re in reliable hands. A crown is essentially a ‘cap’ that covers the entire visible tooth surface, recreating its appearance as well as its stability. Before placing your crown, we remove any cracked or decaying enamel and take an impression of the tooth. 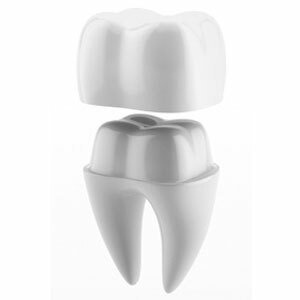 Then, a custom white crown is made of durable aesthetic materials and bonded over the tooth to protect it. The entire process takes about two visits to complete. Additionally, crowns are placed in association with dental implants to act as an artificial tooth. Unlike single-tooth crowns, bridges span across gaps left by missing teeth, anchoring each end of the bridge over a healthy support tooth. The ends of the bridge have a functional crown, where a pontic (false) crown or two is bonded between them. This is known as a multi-tooth restoration. Bridges can also be placed on top of dental implants to replace up to 5 teeth at once. If you have a broken or missing tooth, please contact First Dental Studio to find out more about our tailored restorative options. Ask us about booking a free cosmetic consultation today! Level 1, 245 Albert St.